Even though Lord of the Flies is a frequent submission on any banned books list, many high school students are first introduced to this classic piece of literature in their freshman English class. Using very young protagonists set in a harsh, wild environment, author William Golding's disturbing and engaging novel addresses the themes of human nature and personal welfare, often resulting in violence and murder. Despite its controversial subject matter, it is often considered one of the best novels of the 20th Century. Lord of the Flies turned Golding into a household name, and although Lord of the Flies was his most popular book, he remained a successful author long after its publication. In fact, Golding was awarded the Nobel Prize for Literature in 1983, where he remarked that he sought to “...illuminate the human condition in the world of today” through his novels. Published in 1954 in London by Faber and Faber, Lord of the Flies has sold over millions of copies worldwide. It has been translated into many languages, including Basque and Catalan. Evidently, even though the book focuses on the trials and tribulations of twelve young boys, the themes and archetypes resonate with all readers. First printings of the book feature the iconic jungle theme artwork on the dust jacket. Careful observers will note that the stick figures of the boys blend almost seamlessly into the wild and untamed environment around them, which was undoubtedly a very specific choice by the artist. Because of Golding's fame and influence as a writer, signed first printings are of Lord of the Flies are quite valuable, sometimes pricing as high as $30,000. Faber and Faber, 1954 First Edition, First Printing SIGNED by William Golding on a laid in signature. An attractive dustjacket that is vibrant in color with some wear to the spine and edges. This original First State dustjacket has the price present on the front flap. The book is in nice condition. The binding is tight, with light wear to the panels. The pages are clean with no writing, marks or bookplates in the book. Overall, a lovely copy of this TRUE FIRST EDITION in collector's condition!!! We buy SIGNED Golding First Editions.. Signed by Author(s). 1st Edition. Hardcover. Fine/Near Fine. Faber and Faber, London, 1954 First Edition, First Printing. A BRIGHT ATTRACTIVE dustjacket that is vibrant in color. This original dustjacket has NO chips or tears and has benefitted from some professional restoration. The book is in excellent condition. The binding is tight, and the boards are crisp with light wear to the edges. The pages are clean with NO writing, marks or bookplates in the book. Overall, a beautiful copy of this TRUE FIRST EDITION in collector's condition. We buy Golding First Editions.. 1st Edition. Hardcover. Fine/As New. London: Faber, 1954. Red cloth, spine lettered in white. Light yellowing to page edges; red stain to lower margin of front pastedown and about inches of lower inner margin of front free endpaper; some faint sunning to rear cover; else fine, no visible water stains to the binding. Supplied first state jacket: internal small light red stains along top marigin of mostly front panel and to lower inner corners of both panels, but nothing inside the front flap to correspond to the stain on the endpapers; spine lightly sunned with small red stains at lower inner corners showing through; short split to top rear spine fold; VG otherwise, spine and front panel show well, flap price intact. INSCRIBED BY THE AUTHOR ON PUBLICATION DAY "To Mr and Mrs Nelles with the author's regards 7/9/54". G&G A2. One of the best-known novels in 20th century English literature, it had been rejected by 21 publishers before Charles Monteith picked it from the slush pile at Faber and urged publication of this first published novel by an unknown 43 year old schoolmaster. . Inscribed by Author. First printing. Hardcover. Octavo. London: Faber & Faber Ltd, 1954. First Edition. Hardcover. Very Good/Near Fine. First edition, first printing in first state jacket priced at 12s 6d net. 248pp. Original red cloth with white spine lettering. Very Good with stains and slight bowing to boards, light foxing to edges, in original dust jacket with some offsetting from tape on verso and flaps, still Near Fine, having very subtle toning to spine panel, barely any edge wear, unclipped and unrestored. The author's first book, a post-apocalyptic novel of boys on a remote island descending into barbarity. Scarce in its British first edition in a presentable original dust jacket. London: Faber, 1954. In a trial binding of bluish black cloth, spine lettered in white. Slight rubbing to spine ends; front cover mottled with damp, only a little mottling to rear cover; pencil and small ink owner's names at front; very light yellowing to page edges; else a VG unworn copy. Supplied first state jacket has internal and external red stains to lower portions of panels; bit of darkening to spine and flap folds, with small chips at ends; darkening to upper margins of flaps; internal repairs with white paper tape; just good otherwise, flap price intact. Bookplate (by Edward Gorey) signed by Golding laid in. Gekoski A2 knew of four copies - this makes a fifth. ,,,,. First printing. Hardcover. Octavo. Coward-McCann, 1955 First Edition, First Printing. A magnificent dustjacket that is vibrant in color with NO chips or tears. This ORIGINAL First Issue dustjacket has the price present on the front flap with only a hint of wear to the edges. The book is in excellent condition. The binding is tight, and the boards are crisp with slight wear to the edges. The pages are exceptionally clean with NO writing, marks or bookplates in the book. Overall, a stunning copy. Trades and offers considered.. 1st Edition. Hardcover. Fine/Fine. London: Faber, 1954. Red cloth, spine lettered in white.Yellowing to page edges; small ink name at front; small light spot to centre of lightly darkened spine; else fine. In a later (1956) dust jacket with slightly yellowed spine and flap folds but very nearly fine otherwise, flap price intact. Covered by a facsimile of the first state 1954 dust jacket in as new condition. G&G A2. One of the best-known novels in 20th century English literature, it had been rejected by 21 publishers before Charles Monteith picked it from the slush pile at Faber and urged publication of this first published novel by an unknown 43 year old schoolmaster. . First printing. Hardcover. Octavo. New York: Coward-McCann, 1955. Fine/Fine. First American edition. Fine in a crisp and fine, price-clipped dustwrapper with a tiny tear at the crown. The Nobel Prize winner's key book, his arresting first novel about the elemental savagery of human nature. A beautiful copy. Fourth impression of first edition of 1954. With sticker SIGNED by Golding to title page. DW. Identical in appearance to first edition. Sl. lean to book, spine sl. faded with sl. signs of wear to head and tail, pages sl. age browned. VG in wrapper that is worn and internally stained, chipped at head and tail of spine and corners with short tears at head of spine along joints and has small hole to top corner of upper panel and with small tear in centre of spine but still appears whole and quite bright. New York: Coward-McCann, Inc, 1955. First Edition. Hardcover. Like New. First American edition stated, first printing. Near Fine, with light bruising at spine ends, faint rubbing to corners. Previous owner rubber stamp and two small stains to front free end paper, slight musty odor to pages. In a Near Fine or better dust jacket, with publisher's price intact, faint rubbing at extremities and light toning to spine. A rather fantastic copy. New York: Coward-McCann, 1955. First American Edition. A fine copy in a dust jacket with a tiny chip at the rear fold. Condition: First American Edition. A fine copy in a dust jacket with a tiny chip at the rear fold. London: Faber and Faber, 1954. Book. Near fine condition. Hardcover. First edition, 2nd printing. 12mo - over 6¾ - 7¾" tall. 248 pages. Hardcover binding in excellent condition without defect. The unclipped dustjacket (price intact) is lightly rubbed at the extremities, with minor soiling, minor browning to the spine, and a few spots of browning/foxing to the bottom of the spine. Includes a highly uncommon wrap-around with quotes from Arthur Calder Marshall of the BBC, as well as quotes from the Daily Mail, the Evening News, and the Glasgow Herald. The text is clean and unmarked. Stated on the copyright page: First edition, 2nd impression..
New York: Coward-McCann, 1955. First American Edition. Ownership signature on front free endpaper; very good plus in a dust jacket with some tiny nicks, tears and minor rubbing. New York: Coward-McCann, Inc., 1955. First American Edition. First Printing. Octavo; 3/4 dark green textured paper over quarter beige cloth, with titles stamped in dark green on spine; dustjacket; 243pp. Contemporary owners name and date to front endpaper, sunning to board edges, with faint trace of foxing to text edges; Very Good+ to Near Fine. Dustjacket is price-clipped, with light wear to spine ends and corner tips, else a bright, Near Fine example. Housed in a custom dark green cloth slipcase. 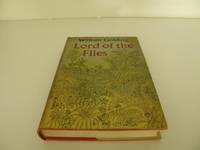 Considerably less common that its British counterpart; when Lord of the Flies was first published in the U.S. in 1955, it sold only 2,383 copies before quickly going out of print. By the numbers, fewer copies of the American edition were produced and survived than the British, which was published at 3,040 copies. Golding's best-known and most controversial novel. Lord of Flies is ranked #41 on the Modern Library's list of 100 Best Novels, and is the basis for both the 1963 Peter Brook film (terrific) and the 1990 film directed by Harry Hook (ghastly). Though it remains one of the most challenged books by the American Library Association year after year, it is likely to be required reading in schools for the forseeable future. Good. New York: Coward-McCann", Inc.," 1955. Stated First American Edition. Hardcover. 5 ½ x 8 . 243 pp. Good in a good dust jacket with the original price of $3.50 on the front flap. The dust jacket is protected in mylar. Moderate insect damage to the dust jacket and the boards. Internally very good. The interior is unmarked. The binding is solid. First edition, second impression (Faber and Faber, 1954). Dust jacket design by Anthony Gross. Original publisher's red cloth; minor rubbing to spine tips; very small date stamp to front endpaper; light toning to edges. Original and unclipped dust jacket has some abrasion and chipping to head and foot of spine panel; a little rubbing and minor chipping to corners; small closed tear to head of rear panel; a few small stains and discreet tape repairs to verso. An excellent copy overall. 1st Edition, 2nd impression, published in the same year. No inscriptions or foxing in the book. Dust jacket is not price clipped or torn, just with very, very slight fraying at the top of the spine and slightly discoloured at the spine. All titles perfectly legible. Lovely copy. Hardcover. Fiction. 248 pp. Gaber and Faber Limited, London (1954). First Edition. Fifth Printing. "Fifth impression mcmlx (1960)" on CP. A bright, clean and unmarked Near Fine copy with a few minor flaws. Lower corners on both boards slightly bumped and rubbed. Spine slightly cocked. Spine ends gently creased and sun-lightened. DJ has 15-shilling price and is moderately worn and chipped, with 3 or 4 small closed tears. More photos upon request. Shipped in a box within a box, in bubble wrap, with a tracking number. London: Faber and Faber, 1954. 1st Edition 2nd Printing. Hardcover. Very Good/Fair. Red cloth hardcover book in very good condition, with ORIGINAL dust jacket in fair condition. This is a second impression of the 1954 first edition, as stated on copyright page. Cover shows signs of shelf wear and some very faded stains, back cover has small tape marks. Spine is slightly bent but not cracked. Front and back endpapers and pastedowns have tape marks, while back pastedown shows remains of previous owner's bookplate. Dust jacket is chipped, frayed and spotted in a few spots. Pages are clean and unblemished. Questions welcome. We ship internationally from the United States and Canada every week. If buying internationally, please be aware that additional charges may apply for heavier books. We guarantee a safe, quick, and secure transaction. 10+ years in online bookselling experience. New York: Coward - McCann, Inc.. Very Good+ in Very Good- dust jacket. 1955. First Edition. Hardcover. First American edition, so stated. Board edges lightly rubbed. A few faint spots to text block edge. The unclipped jacket in mylar has some damage to spine and folds, and large chip to corner back panel. A square tight unmarked copy in unclipped jacket. ; 8vo 8" - 9" tall . Coward-McCann. Good in Good dust jacket. 1955. First American Edition. Hardcover. Stated First American Edition. Dustjacket tattered, torn, and edge worn along spine edges. . Boards edge worn and tanned around edges. Bookseller's sticker on back endpaper. ; 8" - 9" tall; 243 pages . Stated First American Edition, Coward-McCann, 1955. In fine condition, clean and unmarked, boards are bright and without wear or bumping, spine is straight and secure, small book store tag on free front end page "The Personal Book Shop Boston". The dust jacket has a 1.5" x 1.5" piece missing at the top right corner of the front panel, slight wear at spine ends, $3.50 publisher's price intact on flap. Faber and Faber Limited, London, 1957 Very good in a very good dust jacket. Fourth impression stated on the copyright page. Book has slight foxing on the page ends and end papers; previous owner's name on the front free end paper, book very slightly leaning. Dust jacket is intact with original price 15s printed on the front flap; slight tanning along the edges and spine, and very slight chipping at the corners and spine ends. One very minor closed tear on the top of the front panel.. 4th Edition. Hardcover. Very Good/Very Good. 0 First Edition/7th imp, Published by Faber & Faber, London 1963. Near Fine clean and tight condition with no marks or inscriptions. Dustjacket not price clipped and protected in archive cover. A Lovely clean collectable Book. Amereon Ltd, 1975-01-01. Hardcover. Used:Good. 1994-03-05. New. Ships with Tracking Number! INTERNATIONAL WORLDWIDE Shipping available. Buy with confidence, excellent customer service! London: Faber and Faber, 1954. Good. Second impression, same year as the first. A worn, good only copy with numerous small flaws. Coles Pub Group Ltd, 1994-06-01. Paperback. Used:Good. Coward-McCann. Hardcover. B000NAOUC6 Like New Condition. . Fine. Coward-McCann. Hardcover. B000NAOUC6 New Condition. . New. 1995-08-01. New. Ships with Tracking Number! INTERNATIONAL WORLDWIDE Shipping available. Buy with confidence, excellent customer service! 1984-07-08. New. Ships with Tracking Number! INTERNATIONAL WORLDWIDE Shipping available. Buy with confidence, excellent customer service! New York: Coward-McCann, 1962. The dustjacket rightly calls this a "Modern Classic" - one of the great dystopian novels of the mid-Twentieth Century. Originally published in 1955. This is a Very Good copy of the Second Impression (stated "The 1962 Edition" and "Second Impression - September 7. 1962"). White cloth binding, with spine lettering/decoration and front cover decoration in black and red. Clean text; 243 pages, with a two-page biography of the author in the rear. The Introduction is by E.M. Forster. The dustjacket, a rather famous design by George Salter, is unclipped; the spine is darkened, with some sunning at the margins; chips at the head and foot of the spine. In an archival plastic protector. A respectable copy, and much less of a financial hurdle than the First Printing. Size: 8vo - over 7¾" - 9¾" tall. Second Printing.. Hard Cover. Very Good/Very Good Minus. New York: Coward McCann. Very Good in Very Good- dust jacket. 1962. Second Edition; First Printing. Hardcover. Text is clean. White cover cloth is lightly soiled. Previous owner name on front free endpaper. Dust jacket shows light soiling, minor chipping at head of spine. Uneven tanning to rear panel of DJ. Copyright page states 1962 Edition. Dust jacket artwork by George Salter. ; Modern Classics Edition; 9.13 X 6.57 X 1.11 inches . 1983-05-06. New. Ships with Tracking Number! INTERNATIONAL WORLDWIDE Shipping available. Buy with confidence, excellent customer service! 2006-05-07. New. Ships with Tracking Number! INTERNATIONAL WORLDWIDE Shipping available. Buy with confidence, excellent customer service! New York - San Francisco: Coward McCann Inc., 1962. 243 pages. Introduction by E.M. Forster. Right side of title pages illustrated under book title with a drawing. Pages v/g condition. Green endpapers. Previous owner's name top of ffep. White cloth with illustration on upper cover. Black and red title on spine. White dust jacket illustrated in color on both covers. Edges show very light wear. VG+/VG. 2nd Impression. Hardcover. Very Good+/Very Good. NY: Coward - Mccann, Inc.. VG+/VG-. 1962. Second Edition. Hardcover. Some slight foxing to spine and mild prelim creases to top joint area. Some light DJ soil, 1 3/4" x 3/8' bottom front panel edge chip, 1/4" chip at DJ spine tail, and tiny closed edge tears. ; 242 pages . 1997-05-02. New. Ships with Tracking Number! INTERNATIONAL WORLDWIDE Shipping available. Buy with confidence, excellent customer service!